The AntelopeFan is designed as an adolescent antelope to trigger the aggressive, territorial nature of a dominant buck protecting his harem. Bring them charging in for a heart pounding close encounter. 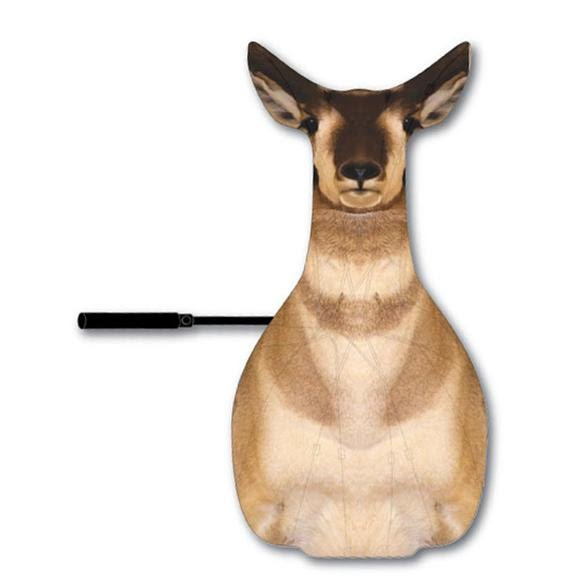 Designed to fool the most weary of animals, even the ones that won't be fooled by one dimensional decoys. Built to be hands free when taking the shot. The AntelopeFan is designed as an adolescent antelope to trigger the aggressive, territorial nature of a dominant buck protecting his harem. Bring them charging in for a heart pounding close encounter. Designed to fool the most weary of animals, even the ones that won&apos;t be fooled by one dimensional decoys. Built to be hands free when taking the shot. Lightweight, portable, and durable - Designed to be utilized in three different styles. Traditional hunting - while set up at a distance from the decoy, wait on an incoming goat, lured in by the decoy drawing his attention off of you to make a shot in close quarters. Locate and set up - Many times its impossible to get into an ambush, but with the AntelopeFan, crossing the open prairie without spooking animals just got easy. Spot and stalk - After locating a dominant buck, move into position behind the AntelopeFan, challenging his dominance and bring him charging in for a close encounter. Measurement Closed: 33.5" x 4.5" x 2"